Republic of Ireland manager Mick McCarthy has strongly hinted that Luton striker James Collins will be called up to his squads for the European 2020 Championship qualifiers this month. The 28-year-old forward, who has played for the U19s and U21s earlier in his career, scored his 20th goal of the season at the weekend during the 2-0 win over Rochdale under the watchful eye of McCarthy. 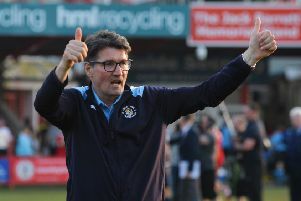 Assistant coach Robbie Keane had been at Kenilworth Road last month for the 3-0 victory against Wycombe, with Collins on target once more, as McCarthy, who names his squads for the matches with Gibraltar and Georgia later this week, told FAI.ie: "James has a real chance of seeing his name in my first squad when I reveal it at Three’s Dublin headquarters on Thursday. "He is my type of player, big and aggressive and wholly committed to the cause. "James can handle himself and is a handful for any defence as Rochdale will tell you. “He’s been around the place for a few years now, he knows the game and his goal yesterday was his 20th this season. "People will argue that he is playing League One but he can only play against the opposition his team are up against. “He worked his socks off all day and he hit the target with his left foot, his right foot and his head.